Two Christmas songs keep running through my head today. One I heard at a restaurant last night: God Bless Us Everyone by Celine Dion. The other is “I can’t believe it’s Christmas, I think I’m finally getting something! I can’t believe it’s Christmas, my favorite time of year,” sung by the incomparable Larry the Cucumber. Despite temperatures in the mid-70s today, it’s clear the Christmas spirit has found me. I can’t say these cookies scream Christmas, although they are pretty good. 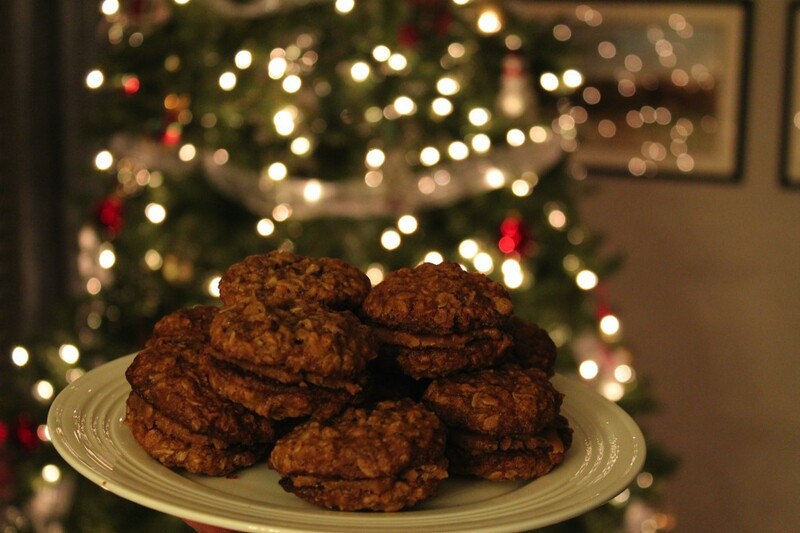 I’ve never had molasses in oatmeal cookies, but it is a welcome addition, one I may apply to regular ole oatmeal cookies. (Hold the raisins, please!) I found the cookies to be pretty large, but if they had been any smaller they would have burned in the 10-minute cooking time. Mine were completely done in 9 minutes. I would also recommend chilling the cookie dough between batches. The later batches spread all over the pan. My caramel sauce also turned out grainy, which I’ll chalk up to user error, although it’s a problem I don’t usually have when making caramel. The flavor is pretty darn good. I’ll give this recipe (found here) 7 out of 10 stars, and that’s being a little generous. Sorry, Martha. Don’t feel too bad. I also made a ribeye steak tonight according to your method, and it gets 11 out of 10 stars. The Noel Balls from Food and Wine were delicious. Don’t let the Medjool dates scare you. These little beauties are delicious, albeit a tad pricey. After tasting them (neither W nor I had tried them before) we checked out the sugar content. 14.5 grams in one date! No sugar added. 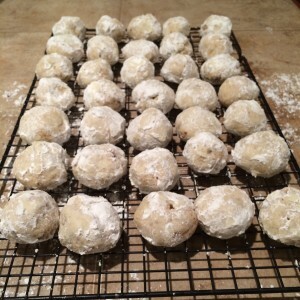 I’ve previously made Pecan Snowballs which were very similar but with no dates. Between the pecans and Medjool dates, these aren’t your everyday sugar cookies. Worth it once a year for Christmas? Probably. Maybe Noel Balls should be the new cookies left out for Santa and Mrs. Claus! This recipe is pretty simple with easy-to-find ingredients and a quick baking time. They also baked up great at high altitude (over 6,000 feet) which isn’t true for every cookie recipe. The final product is appealing and impressive. A perfect solution if you need a quick cookie for a holiday party or to put in a tin to gift to friends! In a food processor, pulse the pecans until finely ground. In a medium bowl, whisk the ground pecans with the flour, dates and salt. In the bowl of a stand mixer fitted with the paddle, combine the butter with ¾ cup of the confectioners’ sugar and the vanilla and beat at medium speed until light and fluffy, about 3 minutes. Add the flour mixture and beat at low speed until just combined. Preheat the oven to 350°. Line 2 large rimmed baking sheets with parchment paper. Spread the remaining 3 cups of confectioners’ sugar in a large pie pan. 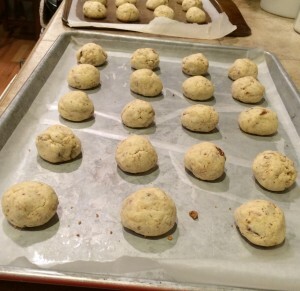 Working in 3 batches, using a 1-ounce ice cream scoop or a tablespoon, scoop the dough into 1-inch balls. Arrange the balls on the prepared sheets at least 1 inch apart. Bake the cookies for 15 minutes, until lightly browned on the bottom; rotate the baking sheets from top to bottom and front to back halfway through baking. Let the cookies cool for 5 minutes on the baking sheet, then roll them in the confectioners’ sugar until completely coated. Let cool completely, then roll again in the confectioners’ sugar. One of my favorite refreshing drinks after mowing the lawn on a hot day is a michelada, a San Antonio favorite! Salt the rim of a large glass (at least 20 oz) and fill it with ice. Then add the Worcestershire sauce, Maggi, lime juice, and Tapatio to the glass. Finally add a dash of celery seed in to the glass. Pour the beer into the glass and stir it well. Enjoy! One of my favorite blogs is The Bitten Word, namely because they are just as obsessed with food magazines as I am. They are in the middle of their 2013 Cover-to-Cover Challenge, and I was happy to sign up. The night before our “assignments” came out, I glanced through the Bon Appetit issue they were using, and noticed the magazine had named its Dish of the Year. 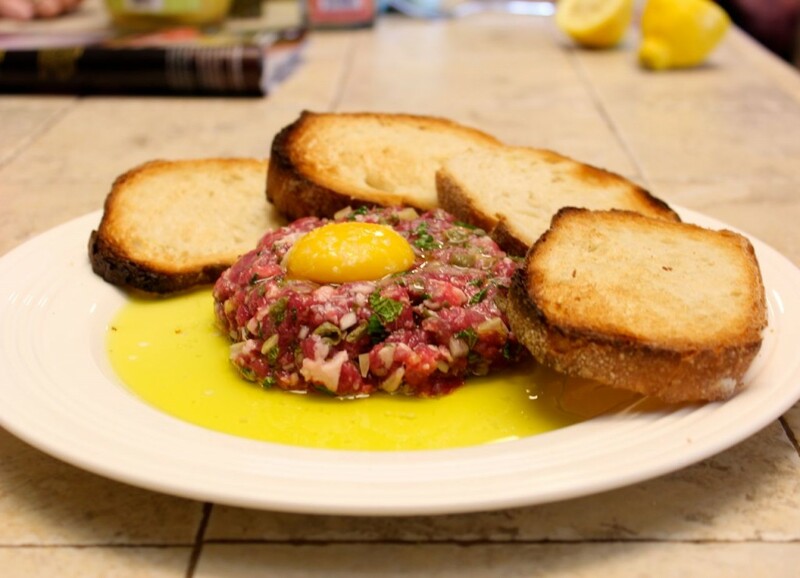 I flipped to the page, double-checked the page number, turned to the next page, flipped back again, and decided that yes, Bon Appetit had actually named Lamb Tartare its Dish of the Year. I shook my head and hoped that wasn’t the dish I was assigned. So I had to laugh when it was. A quick trip to Central Market provided everything I needed, including a pricey rack of lamb and preserved lemons, two ingredients I had never before considered buying. The recipe was very easy: Chop and mix. 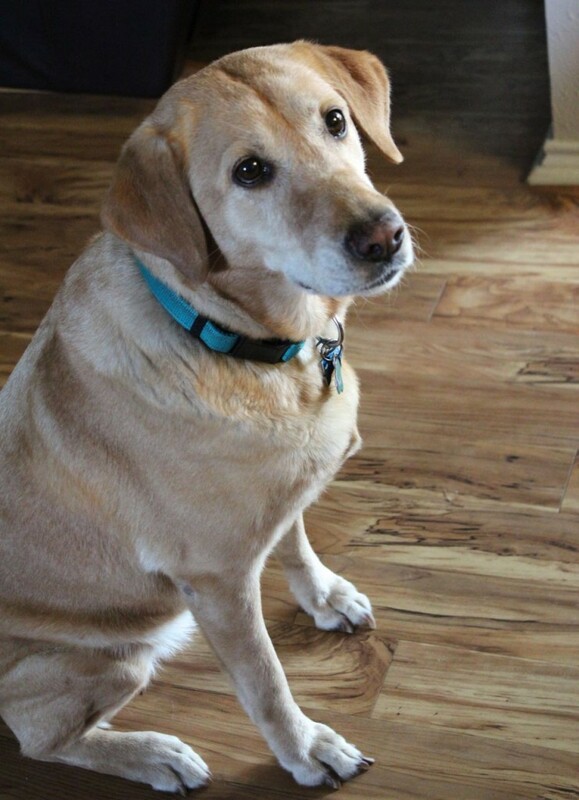 The dog supervised. Two of us tried it while the other two looked on nervously. How did it taste? Pretty darn good. The flavor of the lamb was clean and the other ingredients did not overwhelm it. It tasted remarkably fresh. Even the mint, which I am not normally a fan of, was a great fit. The best comment came from Matt, who said, “None of the flavors in there repulse me.” On a normal night, I would not appreciate that, but I was happy enough that he tried it! However, it also tasted quite good the next day when I cooked it up for brunch. 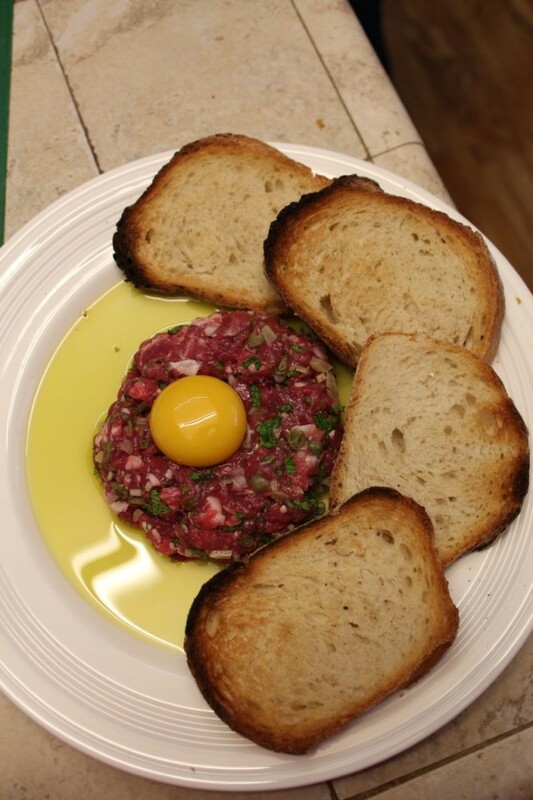 I will leave the tartare making to the experts. In a large zip top plastic bag combine marinade ingredients, add steaks and marinate at room temperature for 20 minutes. Preheat grill to high heat. Remove steaks from bag, discard marinade, and season both sides of steaks with salt and pepper. Sear steaks on grill for one minute per side, transfer steaks to plate and tent with foil. Reduce grill temperature to medium-low heat, about 350 degrees. Place planks on grill, close lid, and heat for 3 minutes. 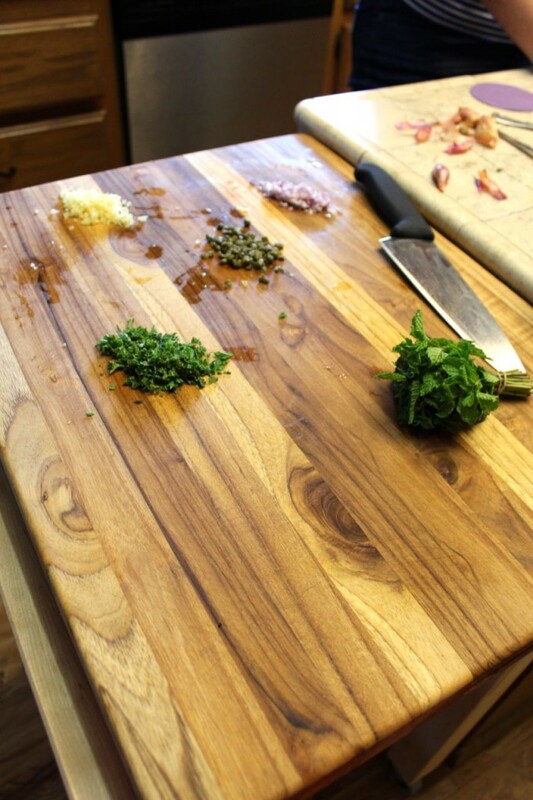 Using tongs, flip the planks and place steaks directly on heated sides of planks. Close lid and grill for 7-8 minutes for medium or until desired doneness. Remove planks and steaks from grill. Allow to rest for 5 minutes before serving. This was a fantastic make ahead breakfast dish! Mom and I made it when she was here this past weekend. PW suggests in the Variations that you can use bacon instead of sausage, which we did. I also added mild green chiles to the dish on a whim. I thought it was excellent and actually I would have omitted the red bell pepper if I was going to make it again, keeping the green chiles. One last change we made was we made 3/4 of the dish using a 1 1/2 quart dish instead of 2 quart, six eggs..etc. It was only 3 of us and Kate since dad wasn’t here, so we didn’t want to make too much. Once again, PW hits a home run! 5 stars! This is one of our favorite recipes and I realized the other day I still haven’t posted it here. Time to change that! This recipe is barely adapted from Allrecipes. 1) In a 5 quart Dutch oven, brown sausage. Remove sausage and drain, reserving 1 tablespoon of the drippings. 2) Saute onions and garlic in drippings. Stir in beef broth, water, wine, tomatoes, carrots, basil, oregano, tomato sauce, and sausage. Bring to a boil. Reduce heat; simmer uncovered for 30 minutes. Skim fat from the soup. 3) Stir in zucchini and parsley. Simmer covered for 30 minutes. Add tortellini during the last 10 minutes. Sprinkle with Parmesan cheese on top of each serving. Preheat and oil grill. 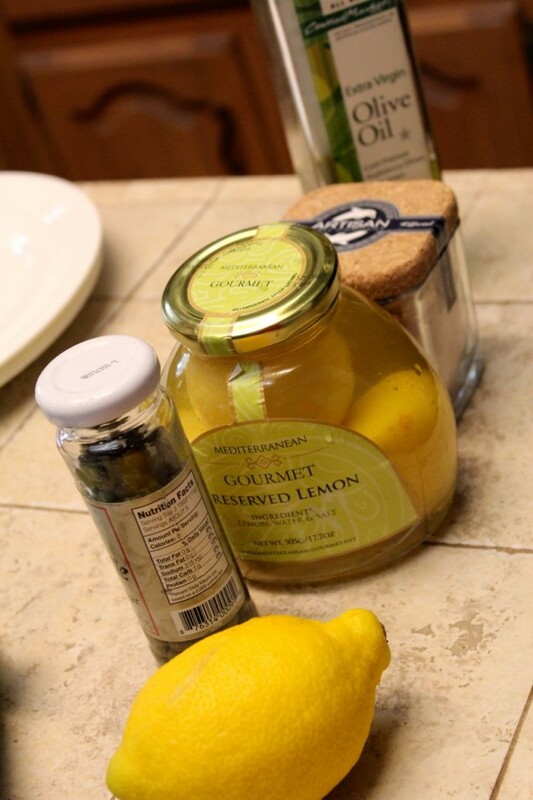 Combine lemon zest, lemon juice, olive oil, and garlic. Add chicken and marinate for 15 minutes. Remove chicken from marinade, sprinkle with salt and pepper and grill until done. To roast tomatoes, preheat oven to 425 degrees. Combine tomatoes and olive oil in an 8 inch baking dish and toss gently. Bake for 18 minutes or until tomatoes are tender. Combine tomatoes with parsley, lemon zest, lemon juice, capers, salt and pepper and stir gently. Serve tomatoes in a small bowl next to chicken and dip chicken in sauce of tomatoes, or spoon tomatoes over chicken. Garnish with Parmesan cheese. I used chicken breasts instead of thighs. Dad put the tomatoes in the grill basket so we didn’t heat the oven. I made these to go with some ribs we made for Spurs-watching party we had last weekend. (Go Spurs Go!) I was really trying to perfect my rib recipe, but alas, they were dry, (either because I overcrowded the pan I roasted them in, or I had company over…not sure which). Anyway, we had these potatoes too, and, well, I didn’t find them perfect either. But, they were GOOD, without a doubt. I used small red potatoes, and those, for me, never have the satisfying crunch and roasted, fluffy texture that Yukon Golds or russets have. But, can you buy small russets or Yukon Golds? Maybe you could make this work with larger potatoes by cutting them in half? Also, I should have salted the water more aggressively, seasoned the potatoes more aggressively, and used more herbs. But these are easy fixes. I’m still searching for my next awesome potato recipe, since I’ve already made my favorite for everyone I know, and the second favorite for almost everyone I know. These have the potential, so I’ll be making them again soon! What wonderful meatballs! They melt in your mouth with just the right amount of spice and whiskey! I did make them a bit larger and still got twenty from a pound of meat. I also used ground beef and ground pork from Tony’s. Yumm-o!